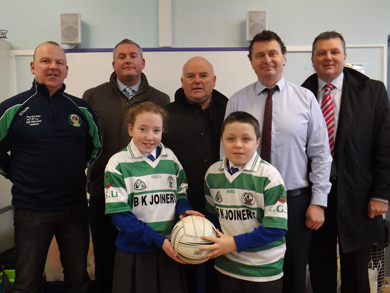 THE Russell Gaelic Union Downpatrick in partnership with their three local feeder primary schools is commencing an exciting new After-Schools Gaelic Football Programme. 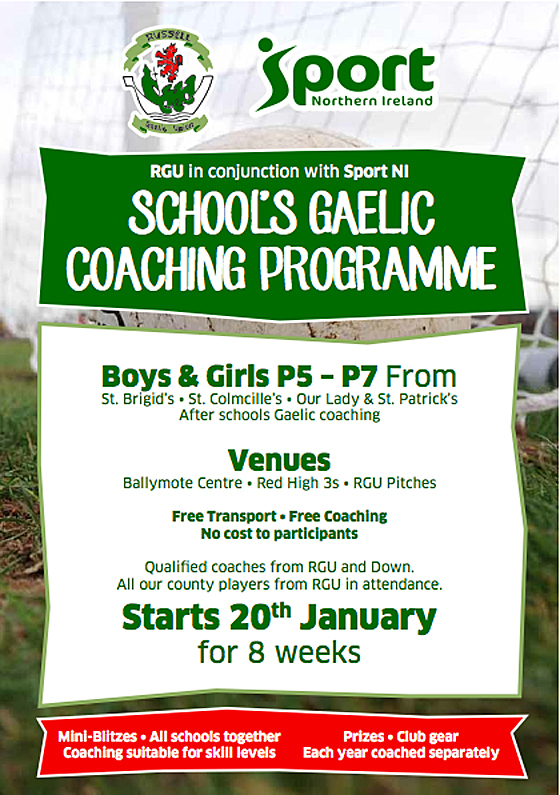 Funded by Sport NI and managed by the RGU’s Schools’Liaison Officer, Aidan Robinson, girls and boys from P5-P7 in St Brigid’s PS, St Colmcille’s PS and Our Lady & St Patrick’s PS, will come together in an innovative eight week programme covering all the fundamentals and skills of gaelic football. Pictured at the planning meeting are RGU Club Chairman Collie Quinn, vice-Chairman Mal McGrady, RGU Schools Liaison Officer Aidan Robinson and school principals Philip Artherton from St Brigid’s and Declan Murray from St Colmcille’s along with future stars Cara McKervey and Ethan Breen. Collie Quinn, RGU Chairman, said: “This is the biggest school’s Gaelic coaching initiative in Downpatrick ever attempted by our club and will bring the three schools together in an integrated approach. Children will be coached on their ability and there will be a special emphasis on encouraging girls to join in and enjoy Gaelic games. The RGU will be using Ballymote Fitness and Well Being Centre, St Patrick’s Grammar School and Pairc Thomáis Uí Ruiséil utilising the three surfaces of hi-tech indoor flooring, 3-G pitches and traditional grass pitches. “Specially organised buses will pick the children up from each school and they will be left back after each session. All children will be fully supervised by teachers from each school along with club qualified coaches. 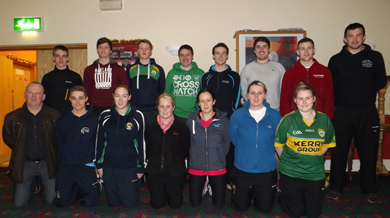 “Twenty local qualified male and female coaches from the club, including all our Down County football stars, will be employed to provide the sessions all under the eagle eyes of Aidan Robinson, and each school will be left with the legacy of a tremendous quantity of GAA sports gear and equipment to allow them to continue to run their own PE and games sessions. This is really a huge project for the RGU and we are looking forward to it”. The first wave of RGU coaches ready to start the big new coaching initiative in St Colmcille’s, St Brigid’s and Our Lady & St Patrick’s this term. Headed up by Aidan Robinson the coaches will work with the schools 3 days a week for 8 weeks coaching the children from P5-P7 in the finer arts of Gaelic football at different venues from Ballymote and the Red High 3G to the green sward at Pairc Thomáis Uí Ruiséil. The coaches have had several meetings already down at Pairc Thomáis Uí Ruiséil planning and running through the drills and games they are going to be carrying out with the children. Not only will this initiative be great for the kids it has generated huge interest from members and players at all coaching levels in the club creating new opportunities for our young coaches. The eight-week programme will wind up with a series of blitzes at PTR which everyone will be able to participate in, along with a draw for free club gear and merchandise. All this will be at no cost to children, parents or the schools. This is a hugely significant investment by the RGU into juvenile Gaelic games in Downpatrick and it is open to all children in P5, P6 & P7 in the 3 local schools. The P5 sessions will be on a Monday 3-5pm, P6 session on a Thur 3-5pm and the P7s will be on a Fri 2-4pm. All children who attend the programme and who subsequently wish to become a juvenile member of RGU will also benefit from a reduced membership rate. The logistics: 250 children, 100 footballs, 48-hours of coaching, 45 mini-buses, 20 RGU coaches, 8 busy weeks, 3 terrific venues, 1 super club, loads of gear and the single goal of enjoying Gaelic football.